The MSU Diversity Summit on Thursday, Nov. 3 began with the question: “What do we mean by diversity at MSU?” The floor opened to responses from 25 tables, seating a total of 400 people, who provided a variety of responses, illustrating the complexity of the question. The President’s Office had been planning the Diversity Summit since early September as a way to gather input from the campus community regarding a diversity and inclusion plan. President Waded Cruzado enlisted Nancy ‘Rusty’ Barceló, a national expert on diversity and former Vice President and Vice Provost for Equity at the University of Minnesota, to help MSU create the plan over the course of this academic year. “Once Dr. Barceló was here maybe two times, she realized we really need to get larger campus input before we start constructing a plan,” Ariel Donahue, director of the Office of Diversity Awareness, said. MSU has also been working with Eric Lopez, dean of the College of Education and Human Development at Texas A&M University-San Antonio. Lopez came to MSU for the year through an American Council on Education Fellowship, and his project is to assist with the development of a diversity and inclusion plan. He explained that MSU is reaching the end of their current strategic plan and will be implementing a new one within the next year and a half, and that the president wants to incorporate diversity into the new strategic plan. “The President’s Office organized the summit in an effort to obtain campus-wide involvement in the development of the diversity and inclusion plan. This was the foundation or the springboard for the development of a university-wide diversity and inclusion plan,” Lopez said. With Lopez and Barceló having spent a significant amount of time at MSU before the summit, the university decided to bring in an outside expert to facilitate the summit. Kim Bobby, who has her doctorate in educational administration and policy studies and is the former chief diversity officer at the University of Puget Sound, came to MSU and facilitated the Summit as an objective expert. The summit was open to students, faculty and staff and aimed to gather feedback from a variety of constituents. “The idea was really to broaden these efforts to a campus-wide level … make sure we were hearing campus’ views on how we should define diversity. Which is the first question, we can’t create a plan if we don’t know what we’re talking about,” Donahue said. Participants were assigned to tables, each with eight people, including students, faculty and a facilitator. Individual organizations on campus, including the Office of Diversity Awareness and the Council of American Indian Programs are making ongoing efforts to address diversity, and the Diversity Summit was an attempt to bring different groups together. “Several units on campus were already working on diversity plans and we didn’t want to stop that process,” Lopez said. Donahue recognized challenges facing MSU regarding diversity, including reaching a consensus about what diversity means and working toward effective communication around conflict without it becoming a fight. “Unifying people around common purpose and goals will be a great challenge, and if we can achieve that we’re going to see some real progress,” she said. “Diversity is so broad, and so honing in on some goals that we as a campus community can all agree on and move towards is a bigger challenge than it sounds like.” She explained that some people want to focus on gender diversity or racial diversity, and MSU needs to bridge all groups and create goals that will address the needs of each group. Lopez recognized the challenge of “wanting to be as inclusive as we can, wanting to make sure that we get as much input from the community in this process because we want it to become MSU’s plan, not somebody else’s and trying to make it fit … One of the things that we wanted to avoid was it being a template — trying to follow someone else’s plan … We wanted one that reflected MSU, that MSU would be able to follow and take ownership of,” he said. Judith Heilman attended the Diversity Summit as a community member. She is the founder and executive director of The Montana Racial Equity Project. “Our mission is advocating racial equity and justice issues, and we do that by educating and informing people about the various facets and manifestations of racism, bigotry and prejudice — giving people the tools to peacefully interrupt whenever they see or hear it,” she explained. Heilman specified that she is a Black American. “It goes well with Asian American, Native American, White American. Especially White American. Persons of European heritage in this country should not merely be called white while the rest of us are hyphenated,” Heilman said. Heilman acknowledged that MSU is not a diverse university as far as black students go, but pointed out that there is a large population of Native students and that there are students, faculty and staff who have had unique experiences related to being a minority. “I think the biggest thing was that [the summit] got people to think, to really think about diversity,” she said. Heilman expects that the university is prepared to deal with inevitable resistance as they develop a diversity plan. “Everyone is coming from a different place of how forward they are in this topic of diversity. There are some people who are definitely stuck in their ways and don’t want to think about it or they’ll get defensive,” she said. Heilman was disappointed that the summit failed to address efforts to retain minority faculty members. “It’s one thing to bring people on, it’s another to be able to keep them, to make sure that it’s a welcoming environment and a safe environment,” she said. “There are things that do happen on the university campus and in the community to minorities that shouldn’t.” Heilman shared anecdotes of minority faculty and students who experienced racism in the community that discouraged them from staying. She believes that as the largest employer in Bozeman, MSU has the power and the responsibility to back up people in these situations. 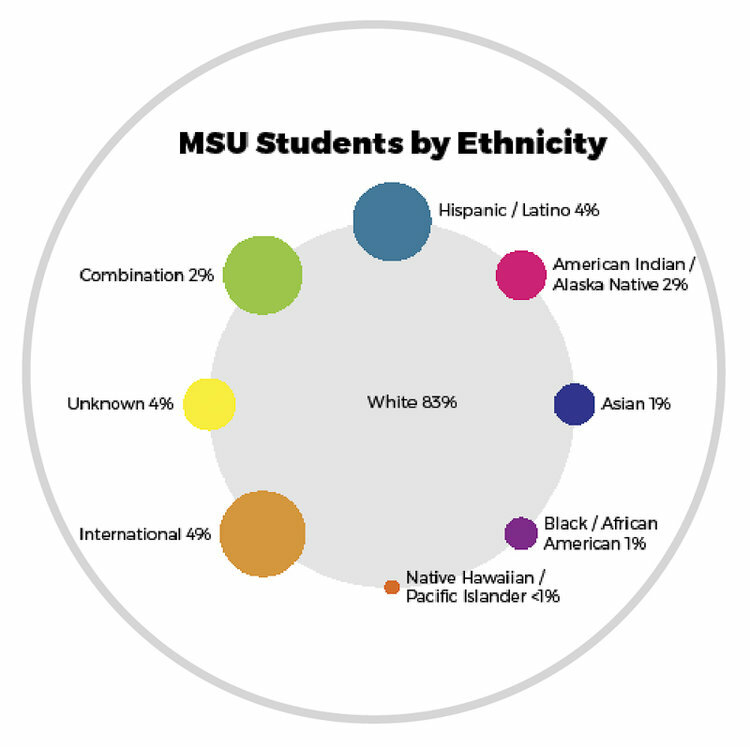 Efforts to create MSU’s diversity plan will continue after the summit. “I think there’s going to be a lot more working groups, conversations and brainstorming sessions before we actually get to planning, but I think in general, this process is moving very fast for such a big plan,” Donahue said. Lopez said that the President’s Office has received positive verbal and anecdotal feedback about the event, and they are in the process of sending out an evaluation. They are also analyzing the responses, which will be posted at montana.edu/diversitysummit/index.html, where indidviduals can review the results and send additional feed back to diversityplanning@montana.edu. “At this point it’s been very participatory. Folks have been very forthcoming with information and participating. I’m expecting that we’ll continue that process as we go through,” Lopez said. “We plan to have at least another summit in the spring to report on where things are at so the plan would be vetted university-wide then recommended to the president.” He added that the plan will hopefully reach this stage by spring or early summer.